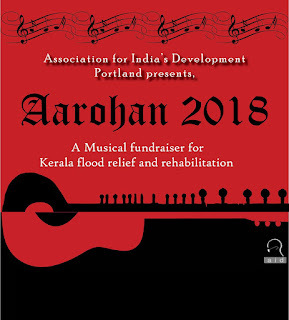 Association for India's Development (AID)- Portland chapter, and Aarohan are teaming up once again to to support Kerala flood relief and rehabilitation. As you may be aware, the floods of 2018 in Kerala caused massive destruction to lives, livelihoods and homes. 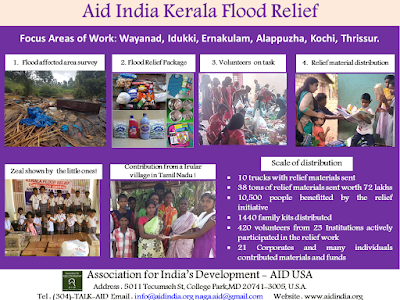 AID has been working with partners in Kerala to help in relief and rehabilitation efforts. To support Kerala relief efforts, Aarohan, Portland's very own local band has come together to help raise funds for this cause. 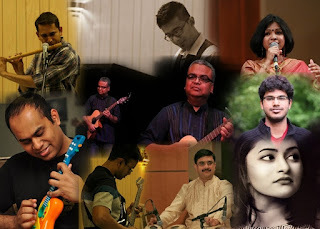 This talented group will present a range of songs - from Bollywood to Bangla Folk, from Semi-Classical to Western - always mixing them in a way that the band find exciting. We invite you with your family and friends to attend this musical evening and help raise funds for those affected by floods in Kerala. We do hope you will stand by the people of Kerala in their hour of need. musicians who offer different genres of Indian music. All proceeds from this event will go to Kerala Flood Relief and Rehabilitation. You can also find the detail of the event at our Facebook page. This website has been last updated on 18th September, 2018.